MANILA -- President Rodrigo Roa Duterte today opened up about the 'origin story' of his most trusted aide, Special Assistant to the President (SAP) Christopher Lawrence “Bong” Go during his press briefing in Malacanang. Doon sa hospital nag-abot kami (ni Bong Go). He offered, ‘kung gusto mo mayor, ako na lang muna, for the mean time.’"
But, Duterte added, he was already close to Go's family through the latter's grandfather. "Yung kabarkada ko, lolo niya. 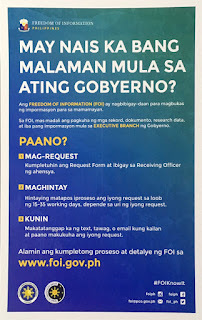 ‘Yung may-ari ng Tesoro printing. That’s the biggest printing company in Davao,” Duterte said. During the same press briefing, President Duterte said that Go should run in the 2019 senate race, adding that he will be a "friend" in the senate. "You’ll have a friend there sa senate, makakabiruan ninyo. Miski yung biscuit at pangkape, mayroon siya sa opisina,” President Duterte said. But if you ask the President, he believes it is a forgone conclusion. "I think Bong is running. Anything can happen, but I believe that he is really running." BUTUAN CITY, Oct. 10 (PIA) -- “If it is in the performance of your duty and you face charges, criminal and all, you need not worry. I will take the blame personally and I will protect you. 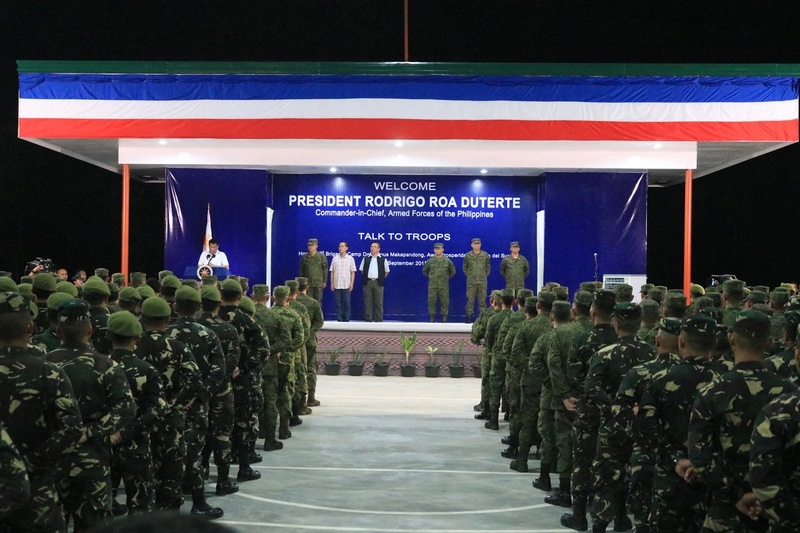 And I would never, never allow you to go to jail,” said President Rodrigo R. Duterte as he addressed the officers, enlisted men and other personnel of the 401st Infantry Brigade (IB) and 402nd IB, Philippine Army. This he conveyed during the traditional “Talk to Troops” held on September 29 at the covered court of Camp Datu Lipus Makapandong, 401st Infantry Brigade, Brgy. Awa in Prosperidad, Agusan del Sur. “We have accomplished a lot since I started this journey more than two years ago. Yet there is still much to do. I assure you that you are not alone in this fight as long as you perform your mandate in accordance with law, this admin remains steadfast in supporting your organization and provide you with the necessary tools and resources that would enable you to perfectly fulfill as defenders of the nation,” said the President. President Duterte also noted that he has seen the hard work, dedication and bravery of the men and women of the Eastern Command in maintaining law and order in their operations and for their wonderful performance. "Maganda ang pinakita ninyo sa bayan and I give you my salute,” said President Duterte. President Duterte further enumerated the relentless efforts of these soldiers for they have neutralized, apprehended, and facilitated the surrenders of the regulars, Militia ng Bayan members, Sangay ng Partido Lokal members, and more than 500 underground mass organization members that led to the recovery of hundreds of firearms and explosives and the discovery of enemy encampments. “Your steadfast support in the campaign against illegal drugs has not only resulted in the confiscation of shabu worth over PhP11 million but also led to the neutralization of drug personalities, securing the provinces of Agusan del Sur and Surigao del Sur,” the President said. Also, President Duterte acknowledged the cooperation of the troopers with the concerned government agencies especially in the implementation of martial law in Mindanao. “These accomplishments, however came at a price. Many have been wounded and lives have been lost. I share my grief with you. I, together with the Filipino people are truly grateful for the gallantry of our wounded and fallen comrades, and encourage our troops to continue to make great sacrifices to defend our land, uphold peace, and secure the freedom we now enjoyed,” said the President. As mentioned further by the President in his speech, he emphasized that performing a duty for the nation is a noble job. “I will not allow a single soldier to stay in prison even for one day. That is my promise to you. We will see to it that the nation that we hand over to our children is one that is more stable, harmonious and progressive. I therefore, ask each of you to continue doing your part so that we may soon realize our aspiration for a lasting peace and stability across the nation. Maraming salamat at mabuhay ang 401st Brigade. Saludo ako sa inyo!” the President added. 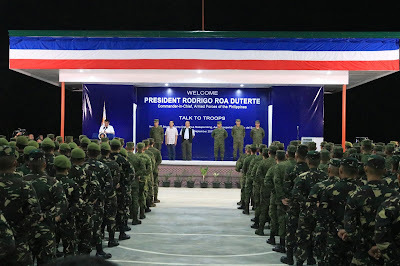 Upon the arrival of the President at the 401st Infantry Brigade, he was ushered by Philippine Army officials to view the 196 recovered firearms by the 401st IB and 402nd IB. Meanwhile, the President also personally led the donning of ranks to the newly promoted uniformed personnel to next higher rank. Gold Cross and Silver Wing Medals were also awarded to deserving servicemen. TANDAG CITY, Surigao del Sur, Oct. 10 -- The Army troopers have confiscated several propaganda materials of the New People’s Army (NPA) terrorists in Carmen, Surigao del Sur, an official said. Captain Francisco P. Garello Jr., civil military operations officer of the 36th Infantry Battalion (IB), said that 28 books espousing Mao Ze Dong thoughts, 392 news magazines of “Ang Bayan”, and 195 news magazines of Lingkawas were seized at Sitio Igis-igis, Brgy. Cancavan, Carmen on October 8. Garello said they received a tip from a concerned citizen in the barangay that a contraband supposedly coming from the Communist Party of the Philippines (CPP)-NPA was dropped-off and ready for pick up. “These reading materials coming from the CPP-NPA Terrorists (CNTs) are vital indicators that they are recruiting in the barangays. They used these materials to shape the heart and minds of the people so that they could entice them to join their group,” he said. BUTUAN CITY, Okt. 10 (PIA) - Bagamat may pagbawas sa budget na nakalaan sa Department of Science and Technology (DOST) sa taong 2019, binigyang diin ni Secretary Fortunato Dela Peña na hindi maaapektuhan ang anumang ongoing scientific research projects ng departmento. Ito ang nilinaw ni Secretary Dela Peña sa isang press conference sa lungsod ng Butuan kamakailan. Dagdag pa ni Secretary Dela Pena, bumaba sa P19.8-billion na budget para sa taong 2019 mula sa P21.23-billion na budget nito sa 2018. 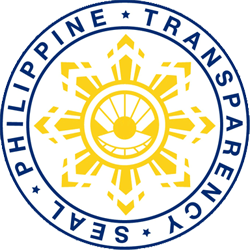 Paliwanang ni Secretary Dela Peña, ang research projects ay madalas na multi-year, at nakalaan na ang budget para dito. Positibo rin si Secretary Dela Peña na mas mapapaigting pa ang kanilang partnership kasama ang Commission on Higher Education (CHED) bunsod ng pagtaas din budget para sa scholarship grants.